Adapted by David Wood from the book by Roald Dahl. First produced by Imagination Stage in Bethesda, Washington DC in 2013. Later produced by the MainStreet Theatre Company, Rancho Cucamonga, 2014. People familiar with Roald Dahl's imaginative, whimsical and fantastical classics will love The Magic Finger, an adventure about a girl with special powers. When Lucy senses injustice, she gets angry and when she gets angry her Magic Finger heats up and then, well, ANYTHING can happen. When Lucy gets upset with her best friend William and his family for shooting ducks for sport, she points her Magic Finger at them and turns them all into bird-size people while the ducks become the size of humans. Lucy's indignation turns the world into a place where the powerless are in charge and the powerful are taught a very big lesson. 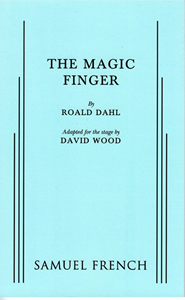 Playwright David Wood's adaptations of the works of Roald Dahl have entertained and delighted audiences for years, and with The Magic Finger, Wood brings another stellar Dahl story to life on the stage. The play was originally written for a cast of seven, doubling. However, a larger cast could be used. The play is published by Samuel French. First Class UK Professional, Repertory and Foreign Rights: Casarotto Ramsay Ltd. US licensing, Samuel French Inc.